Health occupations students from the Dickinson-Iron Technical Education Center who recently competed in the Health Occupation Students of America event at Bay College in Escanaba included, from left, back, Brooke Blaskowski, Trevor Burke, Tori Christian, Claire Czernak, Mary Hanson, Brianna Hoffman and Madison Koski; in the middle are Olivia Krackenburger, Sam Maycunich, Kendra Nora, Brenna Phillips, Faith Rose, Marissa Schilling and Maya Schwamlien; in front are Riley St. John, Saylor Swartout, Taylor Talerico, Lillian Vanloon, Madison Waise and Arika Wickman. Not shown is Carlie Otto. 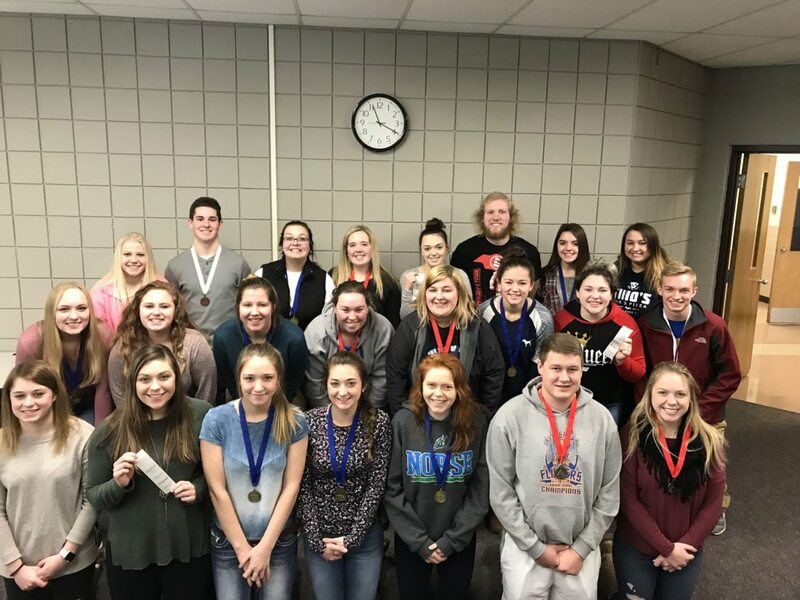 KINGSFORD – Students from the Health Occupations class at the Dickinson-Iron Technical Education Center recently competed in the Health Occupation Students of America regional event at Bay College in Escanaba. Health Occupations Students of America, or HOSA, is a national organization endorsed by the U.S. Department of Education. HOSA’s two-fold mission is to promote career opportunities in the health care industry and to enhance the delivery of quality health care to all people. HOSA provides a unique program of leadership development, motivation, and recognition exclusively for secondary, post-secondary, adult and collegiate students enrolled in health occupations education programs. HOSA is 100 percent health care. HOSA’s mission is especially critical when considering the acute shortage of qualified workers for the health care industry. Students compete in several areas measuring knowledge and clinical skills. 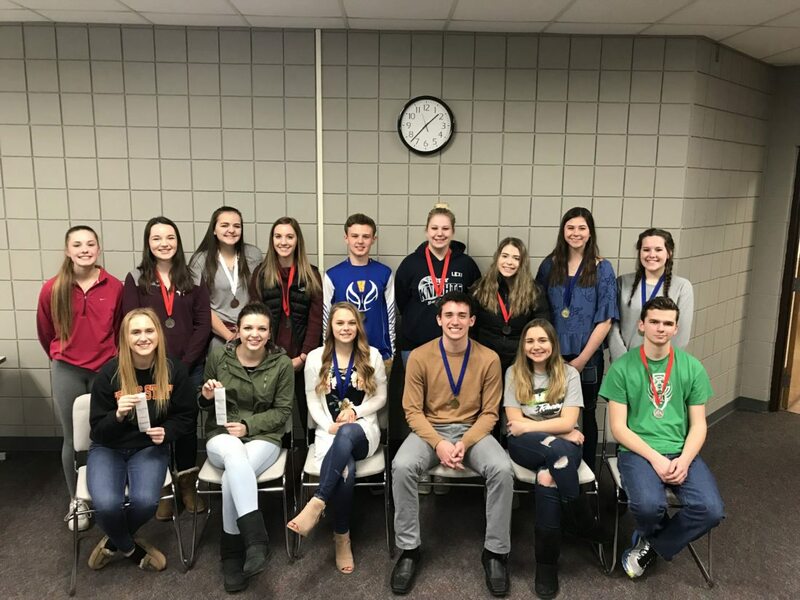 From left, back, are Jaclyn Bal, Kylah Erickson, Tori Kowalkowski, Bailey Lamoreaux, Gavin Londo, Alexandria Miller, Rylee Papp, Abygail Pickett and Morgan Rice; in front are Jacquelyn Rollins, Lauren Smith, Brionna Tomasoski, Jaden Vicenzi, Riley Wollenberg-Schuch and Garrett Muzzarelli. Not shown is Mariah Gyselinck. Health Education Team: gold medal — Maia Steinbrecher, McKayla St. Onge, Juliann Wickman and Brogan Anderson. Creative Problem Solving: gold medal — Jaden Vicenzi, Brionna Tomasoski, Morgan Rice and Gavin Londo. Forensic Medicine: finalist — Jared Miller and Lily Segerdahl. 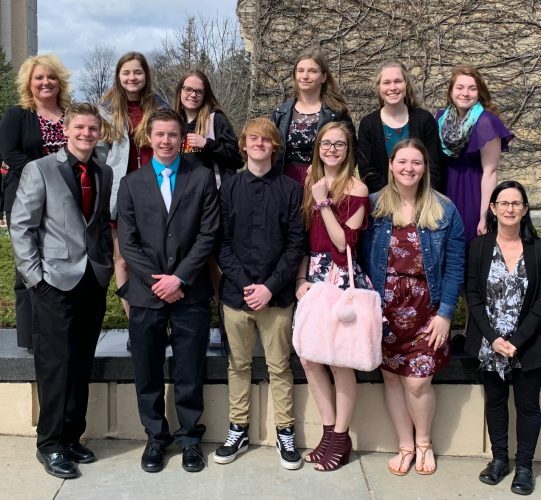 From left, back, are Brogan Anderson, Joe Angeli, Jayden Bear, Madison Briggs, Sam Cross, Ian Driscoll, Kaitlynn Erickson and Mikayla Faull; in the middle are Ayriika Hank, Desiree Hart, Reighan Johnson, Lillian Krejci, Destiny Lambert, Kayla Rivera, Lexi Rundell and Nathan Rutter; in front are Carley Schneider, Lily Segerdahl, McKayla St. Onge, Maia Steinbrecher, Juliann Wickman, Noah Wilcox, and Josephine Yost. Not pictured are Jared Miller and Leah Webb. Biomedical Debate: gold medal — Taylor Talerico, Saylor Swartout, Marissa Schilling and Kendra Nora. Career Health Display: gold medal — Madison Waise and Arika Wickman. 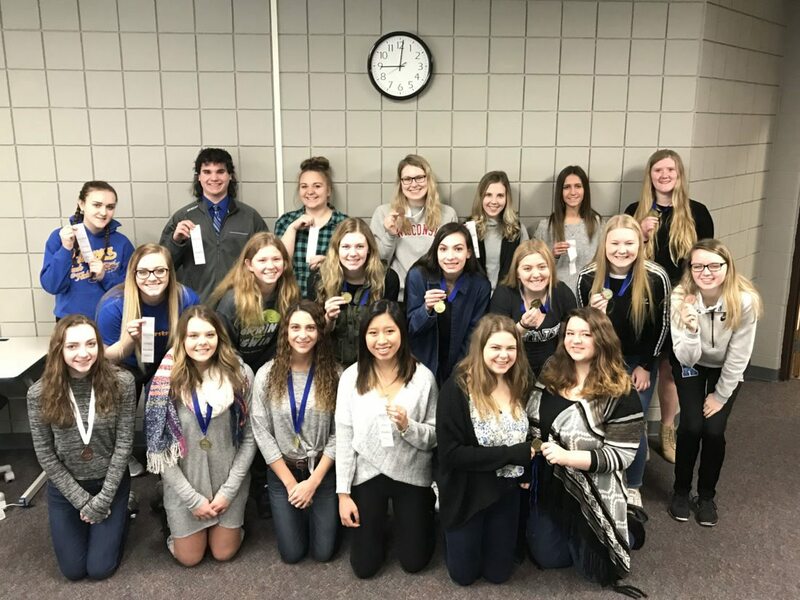 Nurse Assisting: gold medal — Leah Webb; bronze medal: (tie) Carli Otto and Maya Schwamlien; finalist: Brooke Blaskowski, Brianna Hoffman and Olivia Krackenburger. Personal Care: gold medal — Jayden Bear; silver medal (tie) — Lillian Krejci and Destiny Lambert. Medical Assisting: silver medal — Madison Briggs. Home Health Aide: finalist — Toriana Christian. Physical Therapy: silver medal — Noah Wilcox; bronze medal — Nathan Rutter. Sports Medicine: gold medal — Madison Koski. Job-Seeking Skills: gold medal — Brenna Phillips. Interviewing Skills: gold medal — Faith Rose. Dental Terminology: gold medal — Ayriika Hank. Medical Reading: gold medal — Kaitlynn Erickson; bronze medal — Riley St. John. Prepared Speaking: gold medal — Reighan Johnson; finalist — Jacquelyn Rollins. Medical Terminology: silver medal — Bailey Lamoreaux; bronze medal — Claire Czernak; finalist — Sam Cross, Lexi Rundell and Lauren Smith. Extemporaneous Health Poster: finalist — Jaclyn Bal. Extemporaneous Writing: silver medal — Garrett Muzzarelli. Medical Math: silver medal — (tie) Kylah Erickson and Josephine Yost; bronze medal — Trevor Burke; finalist — Mary Hanson, Samantha Maycunich and Lillian Vanloon. Behavioral Health: silver medal — Rylee Papp; bronze medal — Joe Angeli. Human Growth and Development: bronze medal — Tori Kowalkowski. Medical Law and Ethics: silver medal — Lexi Miller. 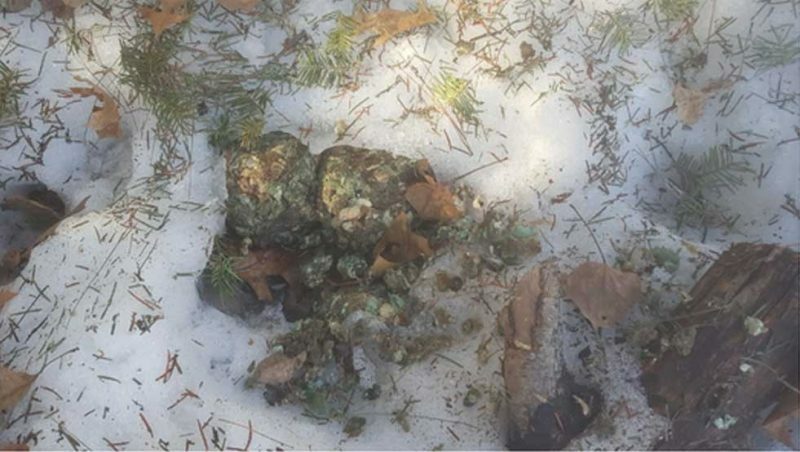 Transcultural Health: gold medal — Abygail Pickett. Nutrition: gold medal — Kayla Rivera. Health occupations students and staff thanked the agencies that assist with supplies and technical expertise. Students now have the opportunity to move on to compete at the state level March 21 through 23 in Grand Rapids. Students are currently fundraising to pay for travel to this competition. Any one interested in donating to the fund can contact Sherie Courchaine, health occupations instructor, at Dickinson-Iron Technical Education Center at 906-779-2697.